Or bass, or cod, or…anything fish-shaped. These quantities serve 4, adjust according to your catch size and level of greed. There is no science, just use the quantities that look right for the fish you have. Handful of fresh herbs, e.g. parsley, chives, coriander, thyme, basil, bay. If you don’t have access to fresh herbs don’t bother with them, but they are nice. This is so easy. Scale and gut the fish and lay in a roasting tin, Push herbs, sliced lemon, butter and seasoning in each gut cavity. Slice up the bacon and quickly fry then scatter over the fish. Smear with oil, add salt and pepper, and toss the tomatoes around. 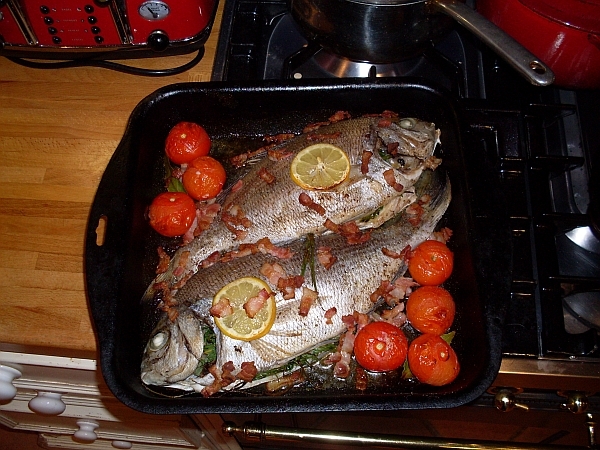 Bake in a hot oven at 220 deg C for 25 minutes – shorter time for smaller fish. Test for done-ness with a poke to see if the spine is still pinky, if not you are good to go, otherwise give it another five. Serve out a side of fish each, it will lift off easily. The tomatoes, butter and fish juices make a lovely sauce at the bottom of the pan – spoon this over the fillets when you serve.